Quilt tester Laura Boehnke creates a color option of at least four blocks for every quilt in American Patchwork & Quilting® magazine. See her variations from this issue. Enjoy the wonders of autumn year-round—without any raking. Appliqué wool oak leaves and acorns, and hand-quilt to create a stunning wall hanging. The use of prints sets quilt tester Laura Boehnke’s version of Autumn Bliss apart from the original. “Don’t be afraid to choose a strong print or plaid as the appliqué foundation,” Laura says. Her appliqués, in the rich colors of the Farmhouse 2 collection by Buggy Barn for Henry Glass & Co., hold their own against a prominent gold-and-red homespun background. Laura machine-blanket-stitched around each fused appliqué with black thread for a folk art look. 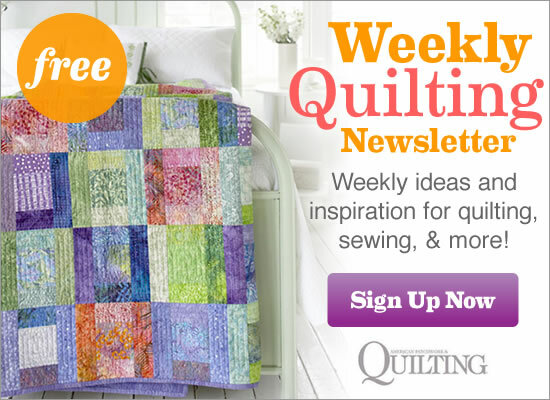 Combine color-saturated batiks into an easy-to-piece quilt you can complete in no time. The warm and cozy flannels of the Frosty Friends collection from Laurie Godin combined with Ro Gregg’s Rock N’ Roll solids, all from Northcott, provide the perfect wintry mix for quilt tester Laura Boehnke’s smaller 49-block version of Fiesta. Click here for instructions needed to make this throw. Do you have a stash of fabric scraps you’ve been wanting to use? Combine those seemingly disparate pieces into a stunning bed-size quilt that is a super stash-buster. Collectors of 1930s prints may enjoy this smaller, more nostalgic version of Scrap Happy. Quilt tester Laura Boehnke selected reproduction prints from the Everything but the Kitchen Sink collection by RJR Fabrics. For a fresh, fun twist, Laura used solid white sashing strips, then added black-and-white prints in the sashing squares, setting triangles, and border. Mark autumn’s arrival with a scrappy wall hanging of Flying Geese and pieced pumpkins. It’s a great way to use up some of your stash. The warm colors in quilt tester Laura Boehnke’s 42-1/2"-square version of Feels Like Fall celebrate autumn’s bounty. Using Mary Koval’s Harvest fabrics for Blank Quilting, Laura replaced the pumpkin blocks with 10-1/2" squares cut from a cornucopia print. A border print fabric of fall fruits makes an ideal outer border. “For a beautiful Thanksgiving table, think about placing this table topper on point then setting the table with earth-tone or deep purple dishes,” Laura says. Posies in full bloom, lush leaves, and tiny flower buds are appliquéd on a background of Irish Chain blocks. Pieced binding frames the table runner with a twist. Are you new to appliqué and want to start out small before committing to a whole project? Take quilt tester Laura Boehnke’s lead and make this one-block table topper. Fabrics are from Robert Callaham’s Canterbury collection for Red Rooster Fabrics. A triangle is the only shape needed to re-create the center of this vintage quilt. Points of the equilateral triangles will match up perfectly, making stitching a breeze. Instead of varying the triangles in each row by lights and darks, quilt tester Laura Boehnke varied them by fabric type. Using the Colorweaves collection from Marcus Fabrics, Laura alternated between soft stripes and heathered solids. “Although my interpretation of Flying Solo has a slightly modern look, the colors are so soft and liveable, I think many people could still imagine it in their homes,” Laura says. Click here for instructions needed to make this table runner. Take on an intriguing challenge with this stunning Lone Star design. You will have triple the fun making various sizes of different stars to create a spectacular king-size-bed quilt. The Antique Americana collection from RJR Fabrics steals the show in quilt tester Laura Boehnke’s version of Reach for the Stars. The two-color collage of vintage advertisements provides an unexpected background in the LeMoyne Star blocks and setting units. Abrupt changes from light prints to dark prints make this small Lone Star radiate. “To visually contain the star, I added a trio of borders,” Laura says. Learn a few new techniques—easy, fusible appliqué and chain piecing—to make this bright and funky Halloween quilt come together quickly. Instead of using appliqué, quilt tester Laura Boehnke substituted prints from The Very Hungry Caterpillar collection by Eric Carle for Andover Fabrics. Create the illusion of circles using only straight seams. In an updated version of the classic Pineapple block, rounds of strips are added in a variety of widths. Contrast in the color and scale of fabrics used creates a distinctive pattern. Quilt tester Laura Boehnke worked from the inside out and framed a dynamic print from the Laguna collection for Timeless Treasures with coordinating prints and stripes. By making just one block and adding borders the same width as the original pattern, Laura created a 33-1/2"-square-finished version of Roundabout to use as a table topper or small wall hanging. For added interest, she pieced small stripe triangles before making them into border corners.